These days everyone knows that they have to fuel their body for optimal results. Whether you’re heading to practice, the gym or a competition, you surely know that you need to eat in order to have energy, build muscle and lose body fat. However, what to eat and when to eat it can be a lot harder to figure out than simply having a protein shake or sitting down for breakfast. Whether you are trying to maximize your performance, increase muscle mass or decrease body fat, eating the right foods at the right times is crucial. The first thing we need to address is avoiding exercising on an empty stomach or in what is known as a “fasted state.” While there is evidence that training on an empty stomach does increase fat oxidation and cause greater mobilization of stored fat for fuel; this doesn’t necessarily mean weight loss. The fat that is initially used for energy comes from within muscle cells and not from the fat below the skin. Once you are done exercising or working out, any fats that are not oxidated will ultimately return to adipose tissue. This essentially cancels out any fat-burning benefits from training on an empty stomach. Not to mention if your work out or practice is longer than 20 or so minutes, you’re likely to feel fatigued and have less strength and endurance. Ok, so now we know that you need to eat before your exercise. But should your meal be based more on carbohydrates or protein? Well, this depends on your sport or physical acivity as well as duration. Generally speaking, consuming carbohydrates before exercise helps fight fatigue and improves endurance exercise performance. This is true because carbs increase blood glucose levels helping with muscle activation. Roughly 70% of the energy in your per-workout meal should come from low-glycemic carbs such as oatmeal, veggies or sweat potatoes. Taking in protein is important in order to prevent muscle breakdown during and after your workout. Also, without adequate protein intake your body will not properly be able to build muscle after workouts and strength training. So if you’re fueling for an endurance related sport, then your pre-workout meal should be mostly carbohydrate based. Those who are weight-lifting or in a sport such as wrestling, should add more protein to their pre-workout meal. Below are 5 foods we recommend to eat before exercising or practicing. We have included some recipes as well as nutritional information. As always, please consult your physician before starting any diet or trying foods that you are not sure if you’re allergic to. 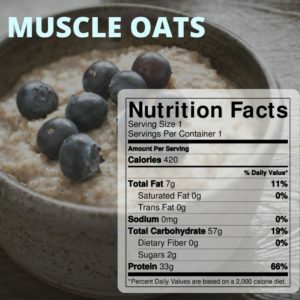 Recipe: 1/2 cup steel-cut oats with 1 scoop whey protein. Prepare oats as instructed on the box and then add 1 scoop of whey protein powder before eating. We recommended Steel-cut (Irish) oats because they are the least-processed type of oat cereal and have a lower glycemic index number than quick-cooking and instant oats. Steel-cut oats take a bit more time to cook however, so if you’re in a hurry, old-fashion oatmeal has very similar nutritional qualities as steel-cut. The nutritional information here is an approximation based and may change depending on the type of protein powder you have readily available. Try to pick one with as little additives and sugar as possible. If you need a sweetener try stevia or honey. Best for: Muscle-building. Consume one to two hours before exercise. Long distance or endurance athletes may want to add a small bowl of oatmeal or a couple of pieces of whole grain toast. 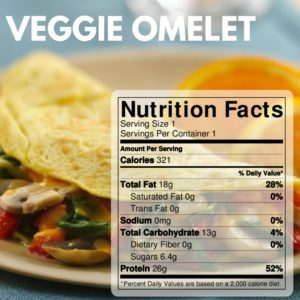 This classic omelet is perfect for those who head to the gym soon after breakfast. Omelets are easy to make and quick. If you think you’re going to be in a rush in the morning or you don’t feel like cleaning up a mess in the kitchen in the morning, chop your veggies in the morning. You can even crack your eggs, beat them and store them in the fridge overnight. Then you just saute the veggies in a little butter or butter substitute in the morning, add the eggs and in no-time you’ll be out the door! 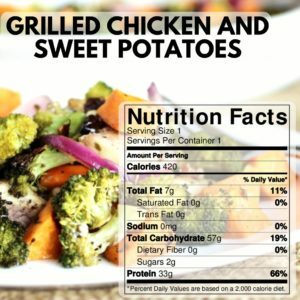 Recipe: 6 oz grilled chicken with sweet potato and broccoli. Grill a 6oz skinless and boneless chicken breast. Bake a sweet potato and sprinkle with a little cinnamon. Steam the broccoli and season lightly with sea salt. Best for: Muscle building and endurance training. Consume one to two hours before exercise. 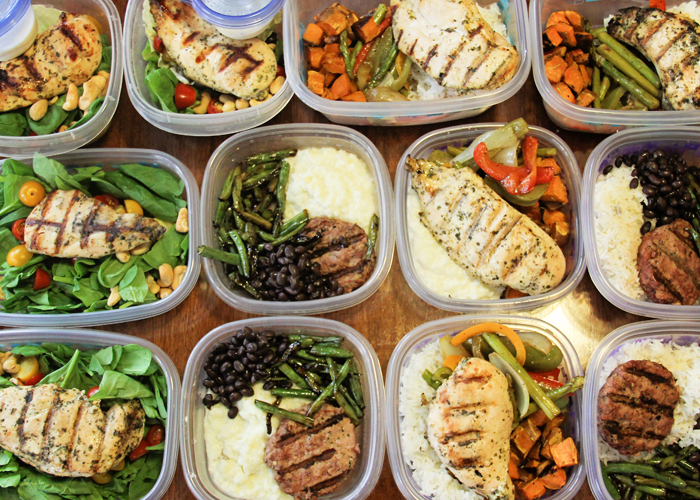 This is a go-to meal for body builders all over the world for a reason. It provides you with tons of protein and low-glycemic carbohydrates to get you through long workouts and practices. If you’re bored or find the ingredients to be too plain you can spice them up a bit: you can marinate the chicken breasts a head of time, try different sweet potato recipes and using a seasoning like Adobo for your broccoli. However, please note that this will change the nutritional value and increase the amount of sodium in the meal. Recipe: Mix 1 cup non-fat vanilla Greek yogurt and 1/2 cup fresh blueberries. Endurance athletes or those going a long time between meals may want to add 1/2 cup of oats. Best for: Muscle building and circuit training. Endurance athletes should add a banana. Consume 30-60 minutes before exercise. 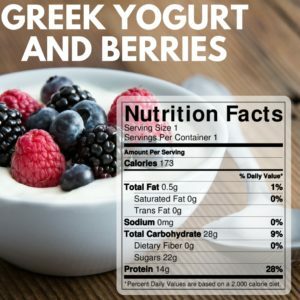 Greek yogurt has almost double the protein of normal yogurt, fewer carbs and half the sodium. Both types are considered to be good sources of calcium, but regular yogurt has about three times the amount of Greek yogurt. This is one of the fastest and easiest meals you can make. We recommend berries that are rich in anti-oxidants and easy to clean, such as raspberries, blueberries and black berries. If you need to add a little bit of flavor to the yogurt try stevia as a sweetener or cinnamon. Best for: Endurance athletes and fast paced sports. Eat 30-6o minutes prior to working out or competing. 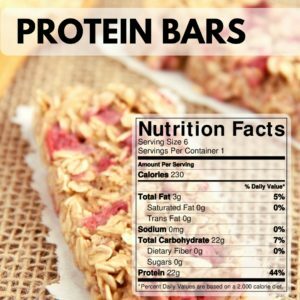 These are great little protein bars and can be made days in advance. Please note that the above nutritional information is an approximation. Depending on the protein powder you use this information will change. For help reaching your nutritional and athletic goals contact us today! We also offer online programs for those who can’t make it to one of our offices!